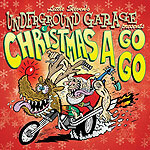 CD review: "Little Steven's Underground Garage Presents Christmas a Go Go"
This review first appeared in the Dec. 12, 2008 issue of the North County Times. Even more than the out-of-print "Hot Rod Holiday," the new "Christmas a Go Go" is the rock 'n' roller's ultimate holiday album. From Keith Richards' jangly cover of "Run Run Rudolph" to the Ramones' "Merry Christmas," the Kinks' "Father Christmas" to the Chevelles' "Come All Ye Faithful Surfer Girls," this disc contains some of the most rocking Christmas music ever laid down. Then there are the soul and R&B tracks from Rufus Thomas and Clarence Carter. Some of the best contributions come from the relatively unknown Electric Prunes and Wizzard, and the underground Chesterfield Kings. Adding to the mix are goofy novelty numbers featuring Soupy Sales and Joe Pesci. It's a consistently fun and hip collection of holiday faves from the famous, the forgotten and the never-known.